Environment Canada’s Marine Forecast currently has a Gale Warning in effect for western Lake Erie. Weather forecasts are calling for strong winds tomorrow morning through Friday morning. Current forecasts are calling for winds from the southwest tomorrow morning and afternoon, switching to the west later in the afternoon and eventually to the northwest later in the evening. Although the forecasts of winds speeds vary, they predict winds from the southwest to exceed 35 km/hr sometime tomorrow morning, increasing to somewhere between 50 and 65 km/hr from the west in the afternoon. Wind gust could reach 75 km/hr. The Marine Forecast is calling for waves heights of 1 m tomorrow morning building to 2 to 3 m tomorrow evening. The southwesterly winds will be driving waves onto our Lake Erie shoreline in Chatham-Kent and Elgin County. There is a risk that wave action could damage shoreline protection works and cause shoreline erosion in vulnerable areas. There could also be some localized flooding due to waves crashing against the shoreline protection spraying water up onto the land. The actual extent of any impacts will depend on how long winds remain from the southwest, and what speeds they reach, before they switch to an offshore direction. 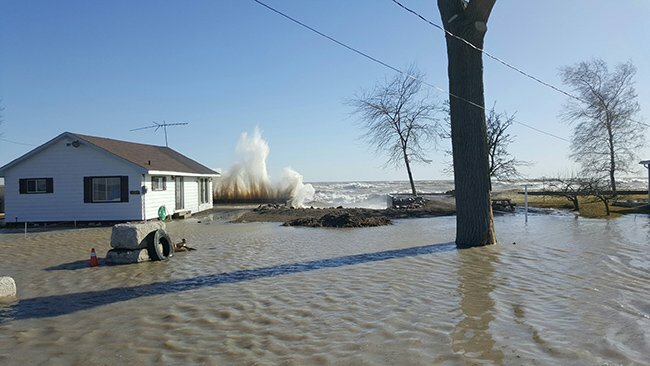 Current forecasts predict that the wind speeds and wave heights could reach levels that caused flooding along Erie Shore Drive in Chatham-Kent earlier this year. Residents in vulnerable areas along the Lake Erie shoreline should pay attention to local weather forecasts. This message will be in effect until November 10th, 2017.